The Ronald McDonald House of Cleveland would not be possible without the donors and the volunteers who help provide comfort to families during their darkest times. Here are just a few of the thank you notes families share with us. Please know that your generosity of treasure and time is greatly appreciated by the more than 108,000 individuals we serve every year. "Thank you from the bottom of my heart for providing such a welcoming and loving home to our family during a time of struggle and pain. The staff is always so kind and cheerful and the events organized make the stay more fun and lets everyone escape their stress and problems for just a moment. We have stayed at many Ronald McDonald homes and have always had the most amazing and rewarding experience." "The Family Room was wonderful. What a difference from other waiting rooms we have been in while my son had surgery. We met great families going through similar situations and were able to support each other. The room was very comfortable and having access to food was so nice. My son fell asleep in the ICU for a couple minutes, so I ran down and grabbed a sandwich. I was so appreciative!" "After our daughter's diagnosis, I was able to find all the resources we needed in one place on RedTreehouse.org. For the first time since we learned the news, I felt supported and empowered to make the best choices for my family." "Our son Simon was born one week ago. He was transferred to a Cleveland hospital hours after birth. He has made great strides in a week's time, and we will be bringing him home tomorrow. We would like to thank every volunteer and staff member for their hospitality and kindness. They truly make you feel like you're at home." "Donating to RMH will change lives. It gives children and parents what they need more than anything - to be together - during what is potentially the most difficult time in their lives. I was once the sick child whose parents RMH kept with me. I donate not just to give back to those that helped my family, but because I know firsthand how it makes a world of difference for children and families. " "Our daughter was born at 24 weeks weighing 1 pound 7 ounces. We will forever be grateful for the Ronald McDonald House. It was our home for almost 5 months. I don’t know what we would have done without them. This was 13 years ago. Today our daughter collects pop tabs, and we make a special trip to drop them off every time she has an appointment with her neurologist." "My mother-in-law introduced me to RMH where she is involved in donating and volunteering at the House. I always believed that supporting the RMH makes such a amazing difference to families during a difficult time. However this past December I had my own experience with RMH and feel even more passionate about it. My daughter was transported downtown with a bad case of RSV. It was the scariest time of my life. The Family Room was the breath of fresh air that I needed. It was nice to see a friendly face and get a cup of coffee when I did not have time to run downstairs. The people at Ronald McDonald House of Cleveland do an incredible job. Thank you for all you do!" For some people, the holidays mean being hundreds of miles from their family while their children are receiving critical medical care. Thanks to the generosity of hundreds of donors, the Ronald McDonald House of Cleveland is able to provide 55 families with a home during the holidays. That's food, shelter, festivities...all things that make life better during a difficult time. As you make your end of year gifts, please consider donating to the Ronald McDonald House of Cleveland. 100% of your donation stays local, and you will help a family in need, whether they stay at the House, visit a Family Room at the hospital, or use resources on RedTreehouse.org. Thank you for being a part of the Ronald McDonald House family. Happy holidays! Beth Fritz was 38 weeks into her pregnancy, and everything was normal. When Beth started having contractions, her husband, Ty, drove them to their suburban hospital. Beth assumed she would be checked and sent home. But an ultrasound discovered that their unborn son was scoring low on movement, so the doctor ordered an emergency C-section. Baby Mason was very sick. He had lost a tremendous amount of blood in the uterus, causing severe anemia. He was immediately moved by ambulance to a downtown hospital with a state-of-the-art NICU. Ty went with Mason in his incubator, and Beth followed later. The doctors weren’t sure Mason was going to make it. Beth was placed in a tiny room at the hospital, while Ty camped out on an uncomfortable couch. After nearly a week in the hospital, doctors found a bleed on Mason’s brain. They took him off the machine to try to stop the bleeding…and he survived. They were relieved, but both parents were exhausted and missing their two-year-old daughter, Addalyn, who was not allowed to visit her parents and new baby brother in the NICU. The best part was that Addalyn and her grandparents could also stay at the House, allowing the family to be together for the month Mason stayed in the hospital. Addalyn could have a quiet breakfast with grandma and then play with the toys or on the playground with other kids staying at the House. 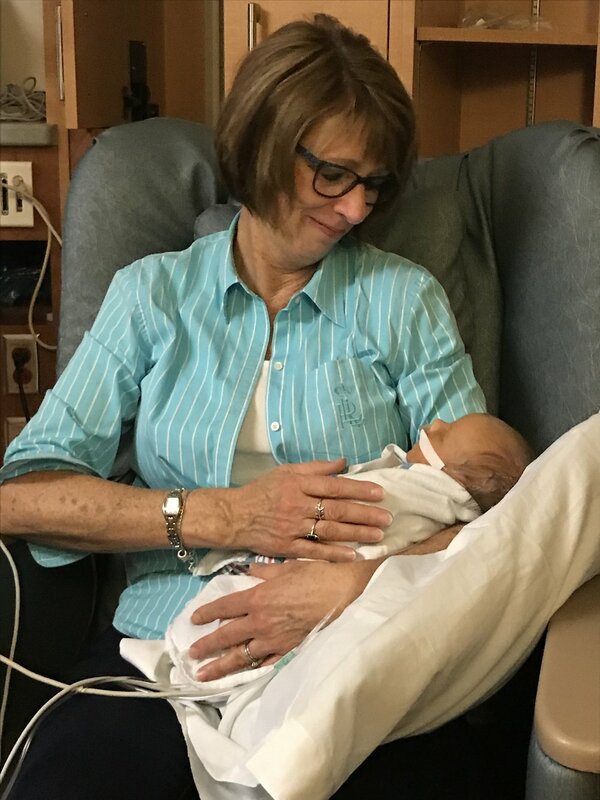 And when Beth and Ty needed a break from the hospital, they could take the shuttle back to the House, play with Addalyn, take a nap…just be mom and dad. Today Mason is a happy, thriving baby. The Fritz Family, like so many like them, did everything they could to help Mason. And the Ronald McDonald House was there for them during their time of need. Without donors, we wouldn’t be able to provide comfort to families when they’re facing scary, life-threatening situations. They ensure that the Ronald McDonald House of Cleveland is ready and able to help these families during their time of greatest need. One Friday afternoon Dr. Laurel Beverly visited the West Side Market to purchase produce. She stopped at a fruit stand and picked out $8 worth of product. As Beverly reached for her wallet, an enthusiastic woman stopped her because she was going to pay for that fruit. When Beverly protested, the woman insisted. “Great things have been happening to me lately. I want to do something nice for a stranger. I’m not taking ‘no’ for an answer!” The woman told Beverly she should just “pay it forward” to someone else. The next day Dr. Beverly attended her third Wine Women & Shoes to benefit the Ronald McDonald House of Cleveland. She always enjoyed it for the wine tasting, the vendors, the fashion show, and the comradery with amazing women. But this year was special. After the live auction, the Ronald McDonald House invites attendees to give Gifts from the Heart (a cash donation to support the organization). What does $5,000 mean to the Ronald McDonald House? Dr. Beverly’s gift sponsors a room at the House for one year. That means 365 days that a family who cannot afford a $20 a night donation has a safe, secure place to stay while their child is receiving medical treatment. The Ronald McDonald House is grateful to Dr. Beverly and the kind stranger at the West Side Market for their generosity. Would you like to give families a place to stay all year? Sponsor a room at the Ronald McDonald House. People tend to gravitate toward those who display an unwavering sense of optimism and hope in times of difficulty and uncertainty. These characteristic of hope and optimism perfectly describe Sidney Taylor, who meets each day with a smile and positive attitude. It’s why, despite her various medical conditions, people find themselves pulled to her story and find courage in her journey. Sidney and her mother Tonya first came to Cleveland from their home in West Virginia after Sidney started coughing blood from her lungs. Sidney and her family visited several hospitals for treatment but was referred to a pulmonologist in Cleveland. After arriving in Cleveland, Sidney began to have gastrointestinal problems, leading her to seek additional treatment from gastroenterologists. 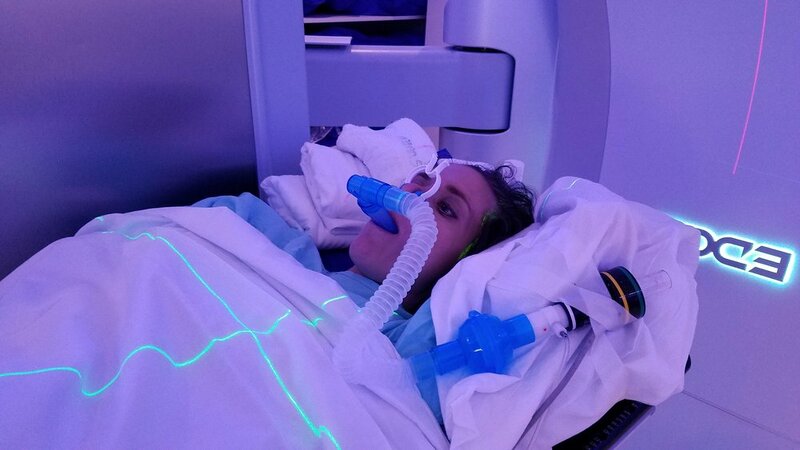 Needing a place to stay due to the prolonged nature of Sidney’s rare condition and treatment for Vascular Ehler’s Danlos, her family reached out to the Ronald McDonald House of Cleveland. The House had a room available and welcomed Sidney and her family with open arms. Since staying at the Ronald McDonald House, Sidney has formed friendships with many of the other families, volunteers, and staff at the House. She has become best friends with Badour, a girl from Kuwait, who she looks forward to seeing each time she comes back to Cleveland. 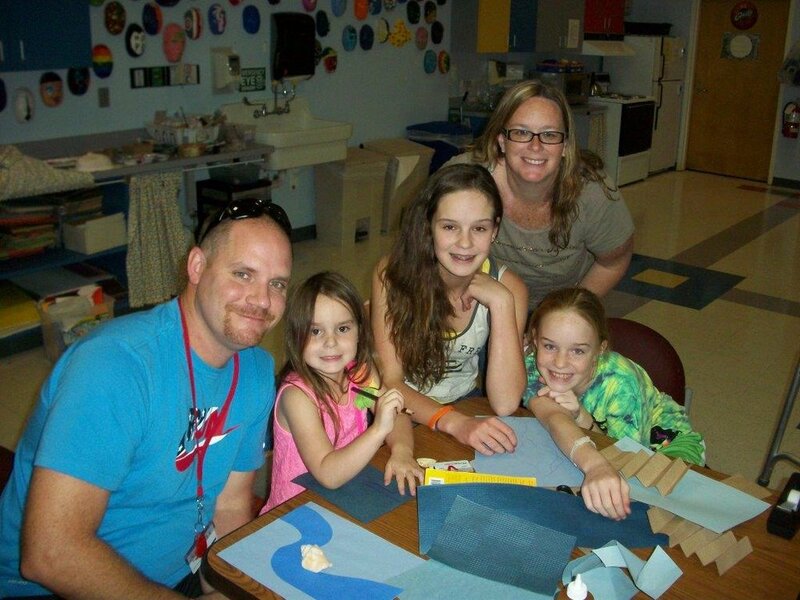 Sidney and her mom have also found friendship in fellow House guests Alyssa, Rob, and their daughter Katie. Ronald McDonald House security guards, Dwight and Stacey, not only keep the House safe, but Sidney enjoys seeking their advice when times get especially tough. During her visits, Sidney and her family have been able to meet people from all over the world and have gotten to experience their culture and language in the process. Badour, who speaks Arabic, has taught Sidney basic communication skills so that she can speak to other guests in Arabic. What makes the House a home? Interactions and relationships with families from different backgrounds who are experiencing similar circumstances and lending their support. “The House is a melting pot mixed with people from all over the world travel to Cleveland with their children who are in need of medical attention," says Sidney. While staying at the House earlier this year, Sidney was surprised with Fuji, an 80 lb. Akita service dog who looks after her and is trained to detect seizures, open doors, and fetch water. Fuji and Sidney have become fast friends, rarely leaving each other’s side. More recently Sidney and the House were the beneficiary of a large donation of Disney themed Duck Tape. 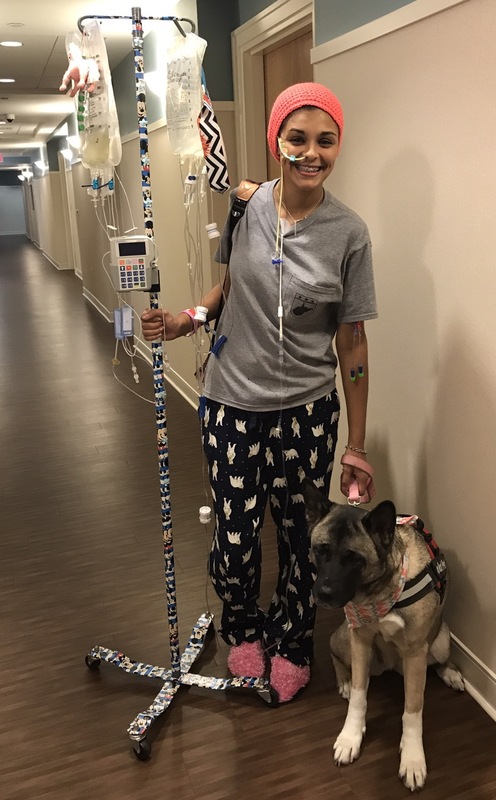 Sidney, who requires an IV pole for tube feeding, fluid bags, and TPN bags, was looking for a unique way to decorate her pole and make it more fun. Noticing the many of the rolls, Sidney jumped at the opportunity to decorate her pole with one of her favorite characters. Toni Hadad takes her boutique of unique and elegant fashions on the road to downtown Cleveland for Wine Women & Shoes on Saturday, October 14, at the Renaissance Cleveland. 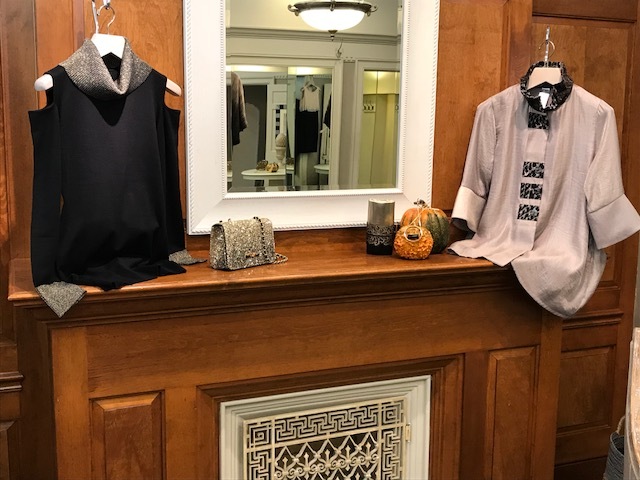 For attendees who haven’t been to Toni in Style, the Chagrin Falls clothing store, they are in for a real treat. This is Toni’s third year organizing the fashion show for the event. She promises to bring clothing from tailor to trendy, daytime to evening dresses, and beautiful evening clothes. Each year’s theme is a kept secret until the big reveal. Year one was a masquerade ball. Year two was a salute to the star spangled banner. What will 2017 bring?! Toni makes sure that her clients get to enjoy the show, a way for them to see the store on the runway. She says they always really enjoy themselves because the event is so well orchestrated, and it’s for a good cause. 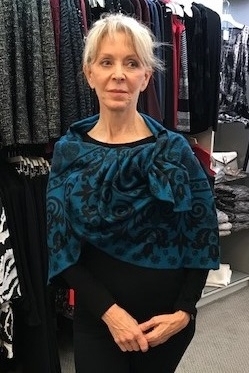 "We are so proud of our partnership with Toni in Style," says Development Director Amy Pausche. "Toni and her team donate countless hours of their time to make this a special event for our friends and the community, which in turn supports the thousands of individuals we serve each year." To learn more about Toni in Style and see more great fashions, like them on Facebook. A handful of tickets are still available for Wine Women & Shoes. Don't miss out. Grab a friend and come see Toni's talents! When times can get tough, people tend to show their true colors. Anna Canady and her mother Jennifer came to the Ronald McDonald House of Cleveland from Lakeland, Florida after Anna contracted a virus two years ago. The virus attacked Anna’s nerves and caused unrelenting pain in both of her feet. Anna was diagnosed with Chronic Regional Pain Syndrome (CRPS). With pain so intense it left Anna wheelchair bound, her family sought help from pain management doctors in Cleveland. After initial appointments, Jennifer and her husband Charles had Anna admitted to a rigorous physical therapy program to help Anna stand again. So far from home, Anna and her parents realized they would need a long term place to stay. That’s when they turned to the Ronald McDonald House. Since coming to the Ronald McDonald House, Anna and her family have found more than just a place to stay; they have found a sense of community. It’s blossomed into many new friendships between their family, staff, volunteers, and other families staying at the House. Anna, who learned how to crochet hats from her grandmother, took part in a knitting class taught by an RMH volunteer in May. Anna used the volunteer's yarn and hooks to start crocheting again. Although she hadn’t crocheted in a long time, the activity rekindled her interest. Since then crocheting has become a passion for Anna…and a way to help and think of others as she underwent her occupational therapy. When Anna and her family went back home for the summer, Anna perfected her art and crocheted more than 50 unique hats. When she returned in early August, Anna gave the hats to her friends at the House. One of Anna’s friends at the House, Khaled, was adamant that she crotchet a bag for him to carry his toys. Not one to turn down a challenge, Anna made a bag and gave it to Khaled, who ecstatically belted “I am just like Mowgli!” (his favorite character from The Jungle Book). Being able to act altruistically and bring joy to others has helped provide Anna with a greater sense of purpose. It allows her to think outward rather than focus inward on the pain and difficulties she faces from CRPS. The House has given the Canadys a place to call home while they’re in Cleveland. But by giving back during their stay, whether it’s through the kindness of Anna making something as simple as a hat for her friends or providing support to other families, they have shown the House that giving is good for everyone. It all started with a sore rib. By all accounts, 13-year-old Jeremy was a healthy active middle schooler. He ran track and cross country, so fast that he came in second in his age group at a popular 5K race in May 2016. A few months later Jeremy was away at camp when he complained that he had an injured rib. A trip to the ER and a blood test later showed that Jeremy had a dangerously low number of platelets. He was transported by ambulance to Cleveland. On July 13, 2016, Jeremy was diagnosed with a rare form of leukemia, which is difficult to treat. Jeremy immediately started chemotherapy. Although Jeremy’s parents, Cindy and Scott Steinbrick, live 20 minutes from the hospital where he was being treated, they were frequent users of the Ronald McDonald Family Room. Thinking they would be at the hospital for a day or two, a complication could keep them there for a week. The Family Room allowed Jeremy’s parents to be with him at all times. It provided the family with free snacks and hot meals, laundry, big comfortable chairs to relax away from the beeps of machines, a kitchen to cook food, and showers. Cindy was able to pack a “go” bag with three days’ worth of clothes knowing she would be able to use the Family Room if she stayed longer. And it was the only place in the hospital open after 6 pm if they were an emergency arrival. In March 2017, the Steinbricks learned the cancer wasn’t under control. Jeremy would need a bone marrow transplant. He and Cindy arrived at the hospital on May 31 for the transplant. Jeremy was discharged on July 9 and is making progress every day. In one year, Jeremy—with one of his parents—stayed a total of 135 days in the hospital. Last year our four Family Rooms served 80,000 individuals. Contributions from donors kept families by their children and gave them a sense of normalcy during a difficult time. Help us continue to serve our families in need. The Ronald McDonald House celebrated the grand reopening of the newly renovated and expanded kitchen patio with families and friends from Majestic Steel USA on August 23, 2017. After the official ribbon cutting, Majestic Steel provided dinner for the families staying at the House. The patio is a gift from Majestic Steel USA. Majestic associates re-laid the bricks, built a retaining wall and granite countertop, installed a new grill, and planted vegetables to feed families. They also made the garden path handicapped accessible and added tables that accommodate wheelchairs. Anchoring the space is a magnificent 10-foot steel tree by artist Raymond Bugelski. Since January 2017, Majestic has provided financial and volunteer support to the Ronald McDonald House of Cleveland. In addition to the patio renovation, they cook family meals monthly, provide volunteers at several events, and completed group projects around the House. Majestic sponsors a room at the House and several events, including Pull Tab Palooza. Garden volunteers Nathalie and Greta are especially grateful for Majestic associates’ help. They saved volunteers hours of work moving soil, mulching, and installing an irrigation system so that they no longer have to hand water the area. Jonathan Leebow, executive vice president and part owner of Majestic, feels the mission of his company—to create a majestic experience for all—and that of the Ronald McDonald House closely align. And giving his staff the opportunity to help others makes his company stronger. Volunteering opportunities at the Ronald McDonald House are available for companies, organizations, family groups, and individuals. 3,709 miles. This is the distance that separates the Blondet/Villacorta family from their home in Peru and the Ronald McDonald House of Cleveland. The family, Miguel and Rosa, their son Vicente and Miguel's mother Amalia, came to Cleveland after learning that their son Adrian would need treatment in Ohio following his birth. It was around this time that Miguel had learned about the Ronald McDonald House from a friend in Lima, Peru. They discovered that staying at the House would allow them to remain close to the hospital, all while providing a warm and supportive environment for their family. With Adrian's birth approaching, the family began their journey to Cleveland. Soon after their arrival in Ohio, Rosa gave birth to their second son Adrian, who is under the careful supervision and treatment of doctors. Since coming to Cleveland, Miguel, Rosa, Vicente, and Amalia have made the Ronald McDonald House of Cleveland their "home away from home." From the gardens, to the community sun-room and homemade volunteer meals, the family has enjoyed many of the amenities that the House has to offer. They have even developed close friendships with many of the volunteers, staff, and families staying at the House. Volunteers Pat and Bobbe and Guest Services Coordinator Molly will always hold a special place in Amalia's heart. As the family continues their stay in Cleveland, grandmother Amalia has returned home in Lima, Peru to continue her work as a holistic therapist. Although Amalia is now thousands of miles away, the experience she had while in Cleveland inspired her to pay it forward to families who are going through similar circumstances. 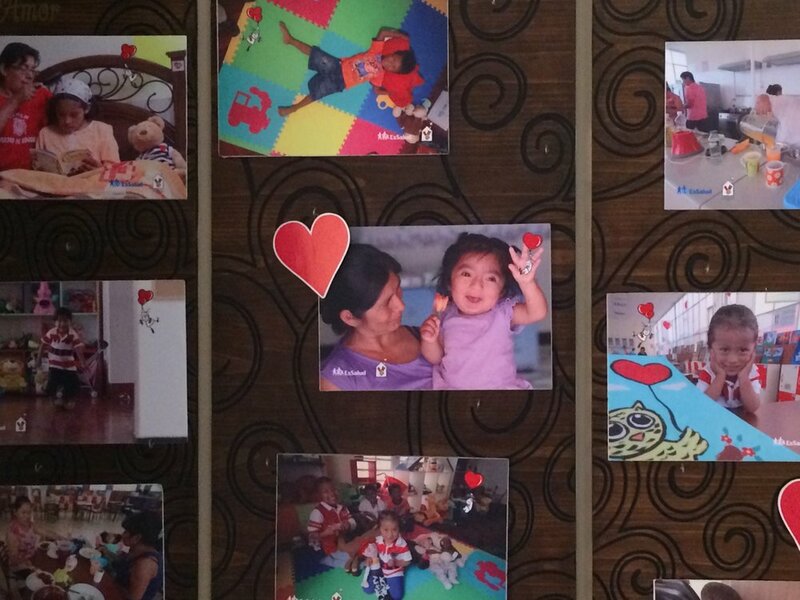 Since returning home, Amalia has become a volunteer at the Ronald McDonald House of Peru. There Amalia has put her work and cooking skills to good use by providing support and meals to the many families that the House serves. When asked what made her want to become a volunteer for the Ronald McDonald House of Peru, Amalia said, “THANKFULNESS!! !” While Amalia let it be known that conditions in Lima are much different, she was grateful for the generosity and support that the community provides so that the House can continue to be a home for families as they care for their children...just as it has been for hers in Cleveland. Family, friends, and a good game of golf. These were just a few of the many things that brought joy to Tom Ackerman who passed away suddenly at the age of 60 of a heart attack in 2012. His wife Micki, daughters Kourtney and Kristin, and their families were left stunned and heartbroken. The day before his heart attack, Tom was at Acacia Country Club playing one of the best rounds of golf he had ever played. After a fun-filled day on the course, Tom went home and spent quality time with his favorite people, his family. That evening, Tom and his family said their goodnights not knowing Tom would suffer a fatal heart attack overnight. In July of that year on Tom’s birthday, the family gathered to pay tribute and reminisce of their fondest memories together, shedding many tears and sharing a lingering sense of grief. That’s when Joe, Kourtney’s husband, had a light bulb moment. Rather than have Tom’s birthday be a day full of tears,why not do something to celebrate Tom's memory. What better way to remember Tom than to invite friends and family to gather together once a year to share memories, laughs, and time on the greens? 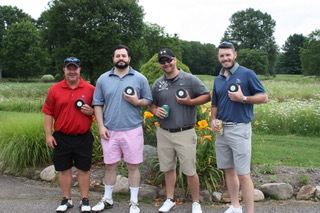 To match Tom’s charitable heart, the Ackerman family decided to make the outing a fundraiser. After a brief search, Micki and her family chose the Ronald McDonald of Cleveland to be the beneficiary of the annual event to help families in need. What began as any other fundraising event has blossomed into a strong relationship between a family coping with their sudden loss and the Ronald McDonald House, whose mission it is to serve families while they care for their children during some of the most difficult times in their lives. 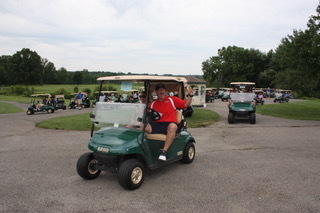 This year, more than 70 golfers teed off at Fowler's Mill in Chesterland, Ohio for the 5th anniversary of the Tom Ackerman Golf Outing, held on Tom’s 66th birthday. Even his grandson Colin got in on the round of 18 holes. 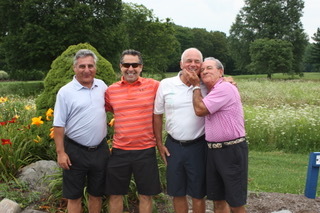 Following a breezy afternoon on the course, golfers and guests gathered in the club house where they took part in a raffle, dinner, and learned more about the Ronald McDonald House. Since the inaugural event in 2013, the Tom Ackerman Golf Outing has raised more than $25,000 for the Ronald McDonald House of Cleveland. The funds raised from the outing have been used to sponsor room 219 at the House. Each time guests enter the room, they are greeted by the sign with Tom’s name. The Ronald McDonald House would like to thank the Ackerman family and friends for their support in helping keep families close and for creating such a fun and welcoming event that keeps Tom’s legacy alive. The 6th Annual Tom Ackerman Golf Outing will be held at Fowler’s Mill on Friday, July 27, 2018. To learn more about the Tom Ackerman Golf Outing, visit the event's Facebook page by clicking the button below. Each time a guest stays at the Ronald McDonald House of Cleveland, they embark on a journey away from their family, friends, and home. What we hope they find when they come to the Ronald McDonald House is a sense of hope, support, and a place where they can call home as they focus on rest and recovery. For Sarah Mann, who began staying at the Ronald McDonald House as a teen, and her husband Michael, their experience at the House has been just that as Sarah continues her battle against cancer. We’ve asked Sarah to share her story of survival with us in hopes that it helps inspires others. Below is Sarah’s story. Illness is something not usually in the forefront of anyone’s mind. However, this world has taught us that anything can happen to anyone at any time. I have learned this lesson all too well, being in and out of hospitals for more than half of my life. After battling renal failure and two different types of cancer as a teenager, I was disease free for 8 years. Unfortunately, one of my cancers returned in 2015 – Ewing’s Sarcoma. Treatment and surgery put me into remission, but that, too, was short lived. The disease returned in 2016. It was at this point that I made contact with a Ewing’s Sarcoma specialist at the Cleveland Clinic. Several trips were made between Illinois and Cleveland for many months, attempting new treatments to keep the cancer at bay, even having my left lung removed in October 2016. Unfortunately, more bad news came this past June when the cancer returned. The scan from June showed three tumors, one pressing upon the heart, causing my right lung to accumulate with fluid. My husband and I went to Cleveland expecting a simple procedure to drain the fluid. Far from simple, the procedure caused my heart to stop three times while on the operating table. It was during this time that we knew we would be in Cleveland for a long period of time. Radiation would begin soon, and then I would start another regimen of chemotherapy. My husband and parents had just spent a week in a hotel, which had not been cheap. We had been informed about the Ronald McDonald House during a previous visit and decided to give them a call. I was accepted, and my family was given a room where they were able to rest and relax while caring for me. I was discharged from the hospital on June 30 and came to the Ronald McDonald House to join my husband. Radiation would begin soon. Until then, we would wait. But our waiting was enjoyable. We have met many families going through a variety of medical issues, each having their unique story. We are grateful to the House because it has allowed us to focus more on me getting healthy and getting rid of this cancer once and for all. We haven’t had to worry about finances, meals, transportation – getting better is the only goal at the Ronald McDonald House. When our 2-year-old daughter came to visit us, we were grateful for the beautiful gardens and the extensive playground that she so enjoyed while she was here. It was a beautiful moment, just being able to be together. That’s what the Ronald McDonald House is. It is full of beautiful moments, moments that families might not have gotten if they had been anywhere else. It is all about family here. Sarah writes a blog documenting her and her family’s journey. To read more about Sarah, visit www.smilingwithsarah.com. Golfers enjoyed a beautiful day on the links (except for a slight rain delay) during the 38th Annual Ronald McDonald House Pro-Am Golf Tournament, presented by Truline Industries and University Hospitals, on Monday, June 19, 2017, at The Mayfield Sand Ridge Club. Amateurs swung clubs and putted with PGA Touring and Local Pros and picked up several tips along the way for improving their game. Touring Pros included Zac Blair, Bud Cauley, Roberto Castro, Ben Curtis, Fred Funk, Jason Gore, Jason Kokrak, Nancy Lopez, Peter Malnati, Larry Mize, Dicky Pride, Hal Sutton, Kyle Thompson, and Harold Varner. The Pro-Am is known as the premier golf outing in Cleveland. Over it's lifetime, the Pro-Am has raised more $4 million to help the Ronald McDonald House keep families close to their children when they need them the most. This year's theme was the Family Meal Program. Each night corporate, nonprofit, and family groups come to the House and prepare a hot meal for our guests. Families don't have to worry about cooking dinner after a long day at the hospital. The Pro-Am committee along with their families come together to have a cookout and meet guests staying at the Ronald McDonald House of Cleveland. To learn more about the Ronald McDonald House Pro-Am, contact Development Director Amy Pausche. Our sincere thanks to our generous sponsors. The Ronald McDonald House celebrated the grand reopening and 8th anniversary of the Family Room at Cleveland Clinic Fairview Hospital on Wednesday, June 14. More than 75 people toured the room, enjoyed cake and punch, and met a family impacted by the room. RMH Executive Director Craig Wilson welcomed everyone to the new room, including speakers Keith Strauss, incoming President of the RMH Board of Directors, Dr. Neil Smith, president of Cleveland Clinic Fairview Hospital, Dr. Hany Aziz of the Neonatology Department, and Deb Small, vice president of patient care services and chief nursing officer at Fairview. All expressed their appreciation for the services that the Family Room provides to their families. It’s a place where parents can rest so they can better care for their children and make the best decisions for them. Also in attendance was the Loschetter family: Erin, Chris, and 2-year-old Emmett. On May 29, 2015, Emmett was born at Cleveland Clinic Fairview Hospital at 28 weeks. He weighed just 2 lbs. 12 oz. Emmett spent 57 days in the NICU. Chris and Erin were on 16-hour shifts with Emmett. The Family Room was a place for them to escape and take care of themselves during shift changes. They used the private restroom (much appreciated! ), shared meals with other families in similar situations, ate snacks to fuel their bodies, and received help from the volunteers. In addition to a bathroom with a shower, the new Family Room also includes two respite rooms, the first of their kind in the State of Ohio. The rooms, which include a bed and lounge chair, are especially helpful for families who live too far away to go to home for their basic needs. Since 2009, the Family Room at Cleveland Clinic Fairview Hospital has served more than 69,000 visitors and provided 164 full meals. The Happy Wheels cart, which debuted last year, has visited 540 patient rooms and provided gifts to 745 individuals. Incredibly 12 current volunteers have been with the room since it first opened: Margie Bejbl; Emese Blankenship; Charlotte Chippi; Karen Hardy; Marie Kaminski; Deb Myers; Roberta Meredith; Rosemary Ogilvy; Ann Opett; Pat Ormiston; Carolyn Sesplankis; and Pauline Yee. The Family Room at Cleveland Clinic Fairview Hospital is one of four Family Rooms operated by the Ronald McDonald House in the Cleveland area. Other rooms at located at UH Rainbow Babies & Children’s Hospital, Cleveland Clinic Children’s, and MetroHealth Medical Center. Who knew a small gesture could make such a big impact? During our 2nd Annual Pull Tab Palooza, the Ronald McDonald House welcomed the Cleveland community with open arms as guests donated their pull tab collections, took part in activities, and met families staying at the Ronald McDonald House. The day began with a visit from more than 20 students and 10 teachers from Greenview Elementary, followed by our friend and avid pull tab collector, Morgan Stock, and her entourage of Morgan’s Angels. Impacted by a growth disorder, Morgan collects and donates pull tabs as a way to raise awareness for and help children who also struggle with various medical conditions. Together with her parents, Michele and Mike, Morgan donated more than 1,221 lbs. of pull tabs. Former guests and friends of the House also visited during the event, donated their pull tabs, and enjoyed a variety of fun activities, including Plinko, corn hole, face painting, snacks, and a Cavs selfie station where guests could snap a picture with LeBron James, Kevin Love, and Kyrie Irving fatheads. Michael Swickard and his parents, Mike and Pam, former guests of the House, donated more than 800 lbs. of pull tabs. Collect-a-Million Club members, Saint Joseph Academy, wheelbarrowed in 480 lbs.-worth of pull tabs. After weighing and donating their tabs, guests enjoyed a magic show by Ronald McDonald, met with some of our furry and friendly animal therapists, and were treated to a visit from Super Heroes to Kids in Ohio. Congratulations to the following winners who donated the most pull tabs in their respective groupings! Thank you to our pull tab donors for helping make our 2nd Annual Pull Tab Palooza a success! This year's final weight was 7,640 lbs. At $.44/lb., the final monetary amount donated was $3,361.60! That's more than 7.64 million pull tabs! Way to #PullTogether! The Ronald McDonald House of Cleveland would like to thank everyone involved: Morgan Stock and Morgan's Angels, Majestic Steel USA for sponsoring the event, Ferrous Processing & Trading Co. for providing recycling services, and the more than 40 volunteers who gave their time to help staff the event. This includes Majestic Steel USA, Kappus Company, University of Mount Union Alpha Delta Pi, Ashland University Alpha Delta Pi, Super Heroes to Kids in Ohio, and Ronald McDonald House volunteers and pet therapists. Each year, the Ronald McDonald House of Cleveland presents its most distinguished award to companies, groups, and individuals who have given quietly, generously, consistently and thoughtfully to the House on a long-term basis. This award recognizes the commitment and constant support provided by these community partners, allowing us to sustain our mission. At our annual meeting on April 26, we honored the following with the 2017 Pillar of the House Award: Mr. Edward Crawford, Fairfax Kiwanis, St. Mary’s Preschool, and ViewPoint Wealth Partners. Mr. Edward F. Crawford is quite possibly one of our longest donors. He began donating in 1979 to start the Pro-Am event, sponsoring the first tee for 38 years! He has given more than $750,000 to the organization. After all these years, Mr. Crawford still gets emotional when he reads notes from families. The Fairfax Kiwanis provides programs and opportunities to enhance children’s lives. Since 2004, Howard Kleckley, his son, and others have visited the House the first Tuesday of every month. They cook and serve breakfast for our families. Nothing keeps them from helping our families, not bad weather or illness. Howard is always here, and he has recruited even more members to help. They are a kind and generous group, and we love seeing them every month. St. Mary’s Preschool, a part of the St. Mary’s Catholic School of Berea, has 69 students ranging from three to five years old. For 15 years, the school has been supporting the House in a variety of ways, including collecting pull tabs for the House, conducting a wish list item drive every Christmas with the families of the students, and holding their annual Winter Concert and Art Show where the children create artwork that is sold to family and friends. The proceeds from the show are donated to the Ronald McDonald House of Cleveland and the House in Minnesota. In 2001, Paul and Don joined their individual financial advisory practices, and since then have grown our team to a "family" of nine. They help clients plan their financial future. ViewPoint Wealth Partners started volunteering with the Ronald McDonald House in 2010. Their team and clients feel that giving back to the community is essential, and they felt the Ronald McDonald House was a perfect fit. Throughout the years, they have cleaned the house, hosted bingo and ice cream socials, emptied rooms of furniture to prepare for the expansion, set up new rooms, took down Christmas decorations, moved mounds of mulch, weeded, added a stone path off the kitchen, and power washed and stained the tree house. In addition to their volunteer efforts, they provide lunch for the House each time they visit. This year their clients will join them for their 3rd annual spring clean-up at the House. They also collect pull tabs and donate more than 50 pounds each year. Thank you for all you do for the Ronald McDonald House! Welcome to Our Newest Partner, The Container Store! The Container Store is opening its first Northeast Ohio location this June at La Place (corner of Richmond and Cedar Roads) in Beachwood. Committed to establishing long-term community relationships wherever they open a store, The Container Store partners with a local nonprofit to be the beneficiary of Grand Opening Weekend sales. We are pleased to announce that The Container Store has chosen the Ronald McDonald House of Cleveland as their Cleveland area nonprofit partner. As the nonprofit partner, the Ronald McDonald House will receive 10% of Grand Opening Weekend sales. Mark your calendars. Grand Opening Weekend is June 10 and 11, 2017. Not able to visit the store that weekend? No worries! You can shop online by using their Click & Pickup service June 5-11. When you select the Cleveland store as your pick up location, 10% of Click & Pickup sales will benefit us! The Container Store is organization heaven. Their products help customers organize everything from junk drawers, cabinets, and closets to entire rooms…even garages! They specialize in designing and installing custom closets and even provide Contained Home, an in-home organization service. Make sure to browse The Container Store website to plan your shopping trip on June 10 and 11. We look forward to seeing you there! When Jill Wallace was 32 weeks pregnant, she and her husband Scott Wallace found out their daughter Scarlett would have medical challenges. When she arrived six weeks later, the Wallaces stayed at the Ronald McDonald House for 28 days in 2014 while Scarlett was in the NICU. “We spent Scarlett’s first Christmas at the House,” says Jill. Six months later Scarlett was life-flighted to the hospital. Jill and Scott called on the House again, staying for 29 more days. For Scarlett’s first birthday, the Wallaces decided it was time to “pay it forward” and give back to the Ronald McDonald House. What started out as a small gathering of loved ones turned into a party for 75 people, with a full buffet and bartender serving drinks. They asked friends to bring donations for RMH. Just before Christmas 2015, Jill and Scott delivered three SUVs full of presents for the families at the House and $500 in gift cards. Happily Scarlett has not been hospitalized since her June 2015 stay in the PICU. Although the Wallaces have not needed the services of the Ronald McDonald House, they continue to give back to the organization that kept them close to their daughter when she needed them most. Jill had a great time with her friends at Wine Women & Shoes, one of RMH’s signature events. Scott’s company, CSA Group, has adopted RMH as a favored charity. Between donations, services, and wish list drives, CSA Group gifts over the past year and a half have exceeded $25,000. Even Jill’s mother has pitched in to help RMH. She received a grant from her employer in Elyria on behalf of RMH to pay for family services at the House and in the Family Rooms. Scarlett turned two years old in December. She has severe epilepsy, needs a feeding tube, and looks like a nine-month-old. But Jill assures us Scarlett is a champ. They’re hopeful that a new treatment of daily steroid injections will help control the seizures. You can read more about Scarlett’s progress on her Facebook page. The creative side of many of Cleveland’s most famous faces was on full display during this year’s Cleveland Home and Remodeling Expo. Expo attendees had the opportunity to view the many unique, funny, and ornate birdhouses created by local celebrities as part of the “Home Tweet Home” exhibit. Positioned on wooden posts for an optimal bird’s-eye view experience, guests were given the chance to vote and bid on their favorite birdhouse as part of a silent auction to benefit the Ronald McDonald House of Cleveland. The Ronald McDonald House of Cleveland was also the beneficiary of the 2016 Cleveland Home and Remodeling Expo’s silent auction. Last year’s exhibit “Better Gnomes and Gardens” raised more than $1,100 for the House. The design “Gnome Sweet Gnome,” created by Sharon Harvey, President and CEO of the Cleveland APL, took home first place. This year’s exhibit, featuring 20 wonderful and wacky designs, raised more than $1,400 for the Ronald McDonald House. Thank you to the following Home Tweet Home participants! Morning Show of Q104 (WQAL) – Cleveland! Congratulations to the Top 3 Popular Vote Winners!